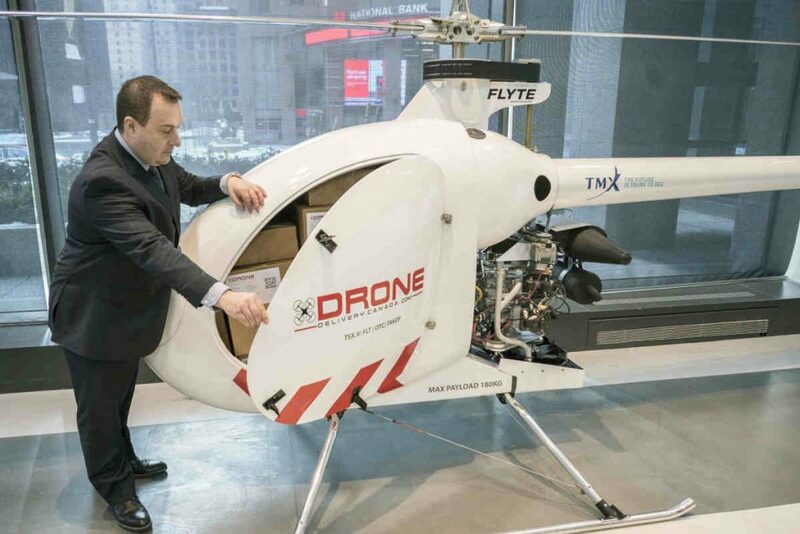 Drone Delivery Canada today at the Toronto Stock Exchange unveiled its new Condor drone, which has been in development for the past year to serve as a delivery cargo aircraft. The Condor is expected to have a payload capacity of 180 kilograms (400 pounds) and a potential travel distance of up to 200 kilometres. The company explains it will work with Transport Canada to secure necessary approvals to begin flight testing the Condor by the third quarter of 2019. Throughout 2018, Drone Delivery Canada (DDC) worked closely with Transport Canada on a Beyond Visual Line-of-Sight (BVLOS) pilot project to operate its Sparrow drone. The Sparrow is powered by an electric propulsion system and can hold a 5-kg payload to transport goods like general parcels and medical supplies. The pilot project tested the Sparrow’s capabilities between the communities of Moosonee and Moose Factory – two northern Ontario towns located approximately 19 kilometres south of James Bay. After completing the Moosonee pilot project, DDC received a Compliant Special Flight Operations Certificate from Transport Canada to conduct drone operations in all Canadian provinces and territories with its now-compliant Sparrow aircraft. In December 2018, DDC then reached a $2.5 million agreement with the Moose Cree First Nation to commercially deploy its drone platform. The Condor, however, presents a potentially significant jump in payload capabilities. Powered by a gas propulsion engine, it measures 22-feet long, 5-feet wide and 7-feet tall. It has a wing span of approximately 20 feet and is capable of vertical take-off and landing. It is equipped with DDC’s proprietary FLYTE management system, which is the same platform used by all of its cargo delivery drones. In January 2019, DDC began testing its Falcon cargo delivery drone with a payload capability of 50 pounds and a travel range of 60 km. Company president Tony Di Benedetto explained the Falcon will begin to address the need for a multi-package "payload compartment solution." The Falcon received approvals from Transport Canada to commence testing within Southern Ontario. The Falcon has a wing span of approximately 12 feet and is anticipated to travel 60 km at a speed of 50 km/hr. The multi-package payload compartment is designed to carry approximately five cubic feet of cargo and will be weather resistant. “We continue to push the envelope in building bigger, larger cargo capabilities within our drone fleet of vehicles,” said Paul Di Benedetto, CTO, at the time of the Falcon approvals. Transport Canada in January 2019 released its regulations for Visual Line-of-Sight operations (VLOS), but the government agency still needs to release BVLOS rules, which is why special permits are required.